Seven ways trees improve the quality of our lives. tThe Missouri Department of Conservation’s educational Trees Work campaign is meant to increase awareness of the benefits our trees and forests provide. Many of us appreciate the beauty of an oak releasing its tender spring leaves or a maple shading our deck without being aware of the real and valuable benefits those trees are providing for our health, our families, our wallets and our environment. Whether it’s a walk in the park, playtime in the backyard, or a hike through the woods, get outdoors and see how trees work for you. Almost anyone could make a long list of the many ways trees directly benefit our lives. It might take a while, however, before they’d think to list relief from stress or increased vitality to our communities. These are just a couple of the social benefits of trees that researchers have identified. The more we study trees, the more we find that there’s even more to gain from them than just firewood, lumber and shade. You are lying in bed in the hospital recovering from surgery and turn toward the window for some inspiration. A view of the air conditioner units on the adjacent roof will not provide as much restorative affect as a view of a more natural setting. You may recover from surgery faster if you can see trees outside your hospital window. A six-year study of post-operative patients with the same type of surgery in the same hospital showed that patients with views of nature were able to be released a day sooner—eight days instead of nine days—than patients with “barren” window views. What’s more, patients with natural views requested less pain medication, and a study of nurses’ notes confirmed those patients generally reported feeling better. 2. Trees at WorkViews of nature assist in the workplace as well. A survey of more than 700 employees in private and public sectors assessed job satisfaction and performance as it relates to views of nature from work stations. Desk workers with views of nature reported almost 15 percent fewer illnesses than those without a view. Natural views contributed to workers feeling more satisfied, enthusiastic and less frustrated than those whose windows did not provide a view of nature. The more green seen from their windows, the better employees felt. 3. Revitalizing DowntownsResearch suggests trees contribute positively to downtown shopping areas. A study comparing downtown business districts reveals that people will drive from farther away to shop in tree-lined downtown districts than they will to shop in downtowns without trees. They’ll also spend more time shopping and come back more frequently. People also are willing to pay more for parking and spend more money on goods and entertainment in downtowns with trees. In fact, downtowns with full-canopy shade trees are perceived as having better character and containing stores with better products and merchants than treeless shopping districts. Researchers found that people in housing surrounded by trees and lawns report their life issues feel less difficult. They also procrastinate less and have higher attention spans than those whose apartment buildings have no grass and trees around them. Park users in Cleveland reported that urban forests and parks offered more privacy and tranquility than their homes. To escape crowds, work, home routines and associates, they sought out heavily forested areas with nearby running water or with unpaved paths. They used such places for reflective thought, resting their minds and thinking creatively. 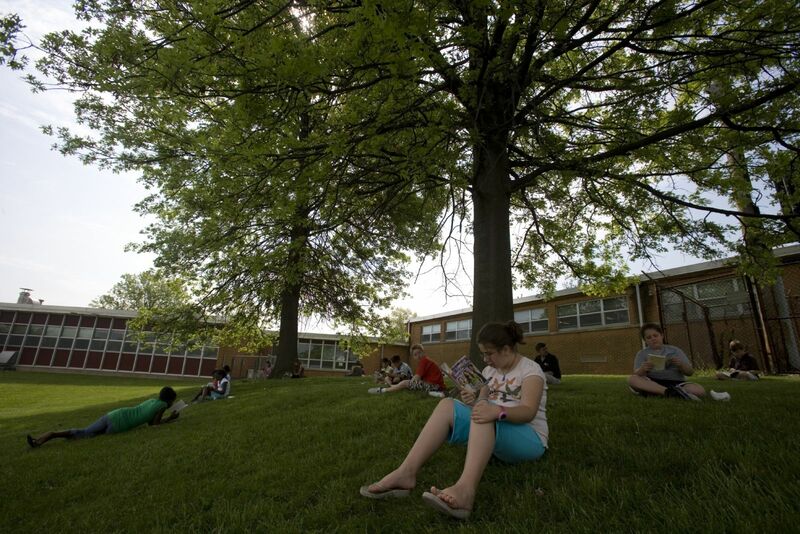 Trees improve children’s ability to concentrate and their reasoning skills. A Swedish study of day care centers found that children attending facilities with natural settings and providing year-round outdoor play under trees had better motor abilities and concentration skills than children at day care centers surrounded by buildings and with less opportunity for outdoor play. In another study, three groups of people were tested on their proofreading skills, then tested again. The first group was retested after taking an urban vacation, the second group after going backpacking and the third group without taking a vacation. Only the group who went backpacking showed improved proofreading scores. Researchers also report that students with views of trees and grass from their college dormitories reported better attention skills than students with more barren views. One in 14 children and many adults suffer from Attention Deficit Hyperactive Disorder. ADHD symptoms include restlessness, trouble listening, antisocial behavior, aggression and difficulty focusing on tasks. A nationwide research project assessed how playing in a “green” environment affects the symptoms of this disease. They found that playing outside in natural environments reduces kids’ ADHD symptoms more than indoor play or outdoor play at basketball courts or skate parks. The more green and natural the setting, the more ADHD symptoms were relieved. One study participant whose son had ADHD reported the only way she found to keep him in school for the entire day without being sent home for behavioral problems was to let him play in a park for a half hour in the morning before school. Have you noticed how neighborhoods with trees seem to have lots of folks out strolling in late afternoons? You’ll also see more kids playing on lawns, people barbecuing on patios and folks relaxing or working in their yards. In a study of public housing projects, researchers found that people living in buildings surrounded by green socialize more with neighbors than those living in buildings with stark landscapes. They also reported a greater sense of community with their neighbors. For the sake of commuters, the sick, your neighbors, coworkers, children, and the vitality of our down town districts—plant and protect trees. They help us in ways we are only beginning to understand. Small Forests are a Big Deal! 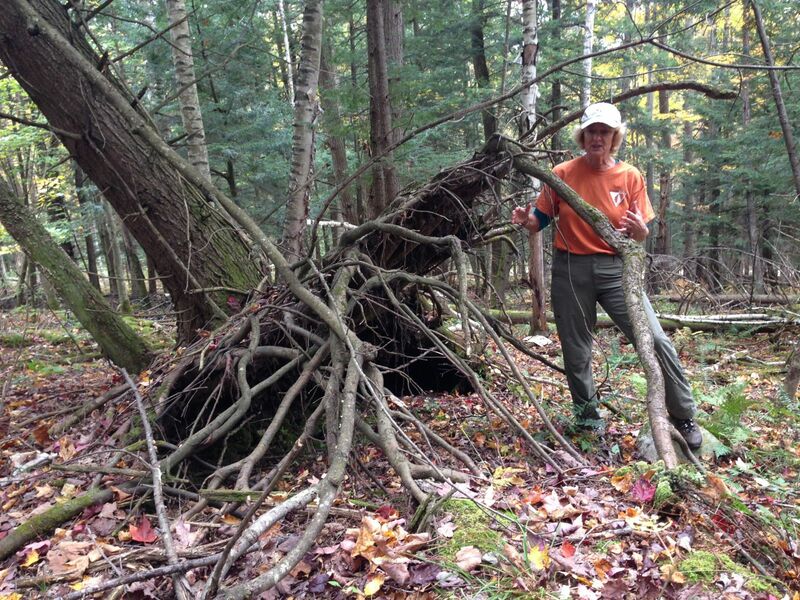 Vermont’s forest landownership is changing. Trends in housing density suggest that the amount of land in parcels larger than 50 is declining, while the number of parcels between 2 and 10 acres is increasing. With financial support from the USDA Forest Service, the Vermont Urban & Community Forestry Program (VT UCF) worked with partners to address this shift with the development of a Backyard Woods Online Course for homeowners of less than 25 acres who want to learn more about the woods in their backyard -- what’s in it, who (wildlife) uses it, and how they can become better caretakers of it. The course includes online lessons, a hands-on session, and a learning journal with activities for participants to complete each week. At the end of the course, participants walk away with a Backyard Woods Action Plan tailored to their specific property. In 2016, VT UCF ran the course for residents of several counties to pilot the program and in 2017, went statewide with nearly 100 participants. According to one participant, "I look at my woods with newfound understanding of how to be a steward. The program provided so much information, direction, and resources which has already and will continue to help me in our woods!" 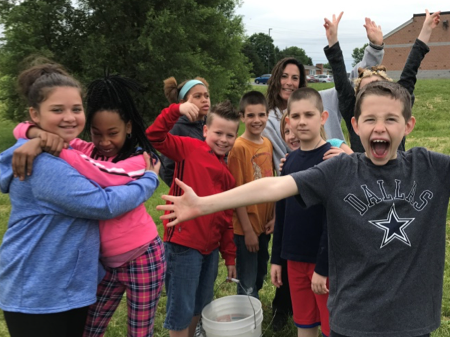 Program participants have identified a range of activities as part of their Backyard Woods Action Plan, including cultivating edible mushrooms, removing invasive species, planting a pollinator garden, and making maple syrup. The course has been successful in helping landowners learn that they do not need to “clean up” their forest. One participant discovered that the forested wetland on their property holds great value. “Our future plan was to try to drain the area of fallen trees and create a pasture or orchard, but after participating in the course, we are now rethinking what we should do. We’d also like to build trails for biking and snowshoeing while at the same time increase areas for wildlife habitats.” Small forests and the landowners that care for them are big deal. Since its creation by the Maryland Public Service Commission in 1999, the Maryland Electric Reliability Tree Trimming Council (MERTT) has been a forum where public agencies and electric utilities meet to discuss how to comply with regulatory requirements through best management practices. The aim is to accomplish both management of vegetation on and off overhead electric rights-of-way and environmental stewardship which directly or indirectly affects electric reliability within the State during a storm event. The members include representatives from the Public Service Commission, Maryland Forest Service, Maryland State Highway Administration and the electric utilities within the state including Pepco, BGE, SMECO, Potomac Edison, Delmarva Power and Choptank Cooperative. Meetings have been held quarterly since 1999. One of the MERTT Council’s first actions was to conduct a series of statewide trainings for Maryland Forest Service field staff, the electric utilities vegetative staff and their tree-trimming contractors. The trainings covered topics such as electric utility equipment, utility vegetative management, tree caused outages, applicable ANSI standards and proper tree trimming in accordance with Maryland’s Roadside Tree Law and Licensed Tree Expert Law. The trainings were designed to enable a common understanding of daily operation between all parties. The trainings were held one in each of MD DNR’s four regions which also roughly correlate to the territories of the six utilities. The cross training was determined to be successfully as communication between both sides became more effective and enforcement actions dropped in number. The MERTT Council has gone full circle and determined 17 years later, there was again a need to hold the cross training for state and utility vegetative management staff. The training covered the basics of the first training with additional information on conducting work on state lands and an emphasis on two new major changes to utility vegetative management in Maryland – the recently adopted Public Service Commission’s Vegetative Management Requirements as well as the Commission’s Rule Making 43. The regulations and rule making outline line clearance distances based on line voltage, customer notification, and the specimen tree designation which enables these specific trees to not be trimmed or removed. This year approximately 250 staffers attended the statewide trainings and there have been requests to conduct the training on a regular basis from the electric utility companies. 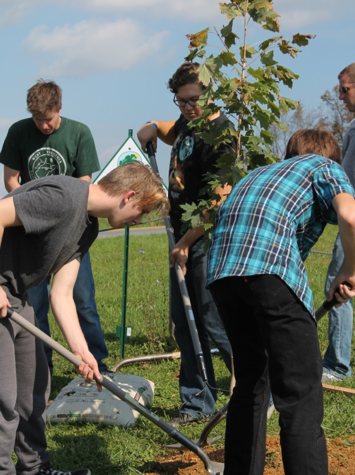 The State of Wisconsin is leading the way in the green industry by providing the nation’s first Arborist Apprenticeship Program, which will include plant health care as well as tree care. Currently, there are three private tree care companies who have signed on five apprentices who are learning and developing their skills under the direct guidance of certified and skilled arborists. More employers are needed to support the program and be willing to hire apprentices. Apprenticeship is a proven method in numerous industries and the benefits greatly outweigh the commitment incurred by employees of all sizes. It provides a structured training program for developing safe, skilled and productive employees and workforce. This program brings additional benefits: providing a career pathway for individuals to join, growing individuals within the industry, getting the arborist profession recognized as a skilled trade with the U.S. Department of Labor, and helping our private businesses and municipalities find and retain qualified employees. The Arborist Apprenticeship Program was designed by industry professionals from the private, municipal and educational sectors, with assistance from the Wisconsin Bureau of Apprenticeship Standards (BAS). Overall, the program is 42 months (3.5 years) consisting of no less than 7,000 hours, including 440 hours of paid related instruction and minimum of 6,560 hours of on-the-job learning in nine mandatory work processes. Apprentices are trained by skilled employees designated by the employer and eventually will become skilled workers who can train future apprentices. Paid related instruction will be provided initially by Milwaukee Area Technical College and will expand to additional colleges based on industry demand. Apprentices are also required to study for, and pass, specific certification exams required by the program and their employer. Job task hours can be retroactively applied, and it may be possible for apprentices with prior Arboriculture/Horticulture education to be given credit for some classroom instruction. Each employer is obligated to establish their apprentice’s pay scale at 60% of what a typical skilled worker in that company earns. The program is flexible and can be tailored to meet employers’ needs and schedules while maintaining the minimum requirements needed to develop a competent, safe and productive employee. The Wisconsin Bureau of Apprenticeship Standards will designate an Apprenticeship Training Representative to assist the employer in setting up the contract for each apprentice and provide guidance throughout the apprenticeship program. Each apprentice undergoes an initial six-month probationary period where both the employer and the apprentice can make sure it’s a good fit. This program can be used for brand new, or current employees who show potential and future promise. For over 15 years, through support from the PA Dept. 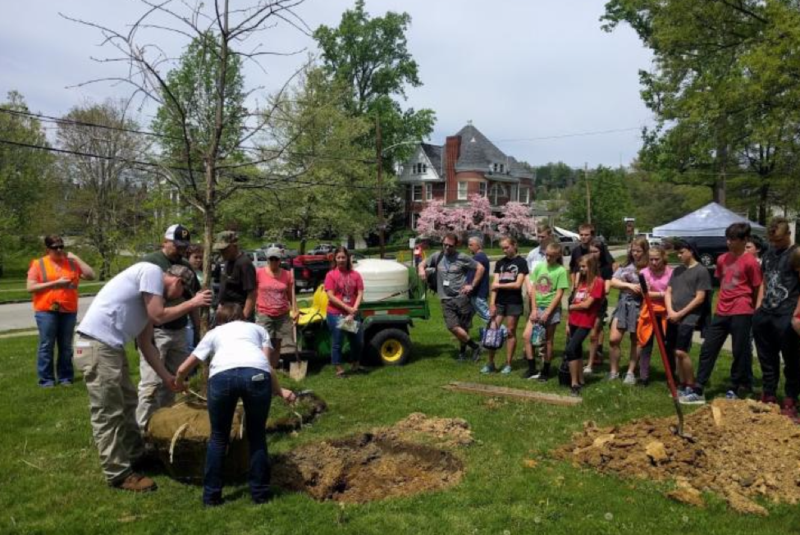 of Conservation and Natural Resources (DCNR), the PA Urban and Community Forestry Council (PAUCFC) has been awarding tree planting grants to communities across the state. The reach of the program is expanding as evident of more and more first-time applicants, such as the Waynesburg Borough who received a 2017 TreeVitalize grant. Waynesburg Borough, located in the very southwestern corner of Pennsylvania is just 50 miles south of Pittsburgh, PA. Waynesburg is not an “urban” area and therefore they questioned their qualification for this type of grant so we continue to stress the term communityforestry. 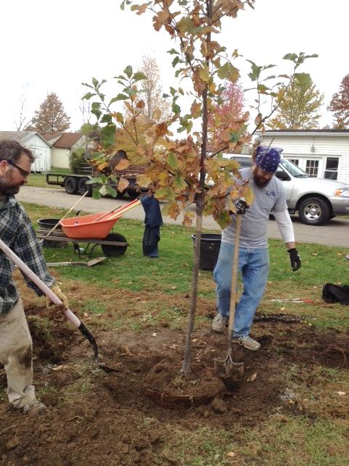 Waynesburg received a small grant to plant 13 trees in the Waynesburg Parks. The parks are four consecutive tracts of land, 2 blocks from Main Street and a gathering place for nearby residents and students from Waynesburg University. The planting took place on Friday, April 28, 2017 in celebration of Arbor Day. Staff from PA DCNR Bureau of Forestry, PA Urban and Community Forestry Council (PAUCFC) and two middle school science classes helped to plant the trees. Tree holes were dug ahead of time and the right tree was placed next to each hole. Equipment was laid out for the students upon their arrival. Maps were printed to show where all the trees were to be planted. People were split into groups of 4 to 5 including a leader to demonstrate correct practices. There were too many students and not enough trees therefore a few students stood ideal while others shoveled or raked. At the end everyone reconvened to discuss the day. What makes this tree planting unique is the connectedness between the place and those that planted the trees. Two of the Pa DCNR staff members that helped plant the trees are from Waynesburg. Additionally, the science teacher of the junior high science classes that volunteered that day was the same science teacher of the DCNR staff from over 20 years ago. In a small town, such connections are not uncommon but it certainly made the day feel more meaningful. The staff shared their memories of growing up in Waynesburg and of playing in the parks where the trees were planted. They spoke of how the students’ efforts of that day will be able to be seen years from now, and the impacts those trees will have on future generations. Many communities plant bareroot trees in the spring because that’s what is available, they’re cheap and easy to handle. The drawback to planting bareroot trees in spring is their poor survival rate. The culprit is the lack of fibrous roots to take up water and nutrients and the need to water during dry periods in the summer. 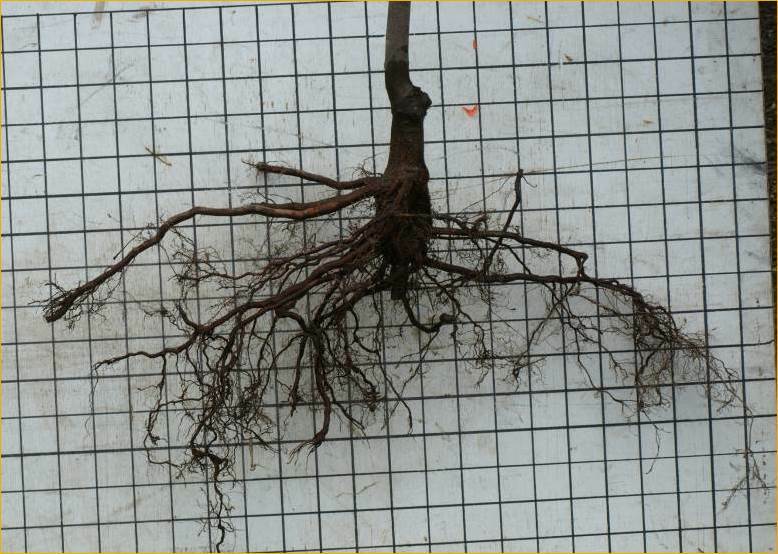 Roots of a bareroot tree before going into a gravel bed. Fall is a better time to plant bareroot trees because while the roots continue to grow, the crown of a tree will stop growing when air temperatures are cooler than soil temperatures. The drawback to fall planting is balled and burlap trees are usually the only stock available from nurseries, and are expensive and hard to handle. So what is a city to do? Construct a gravel bed! 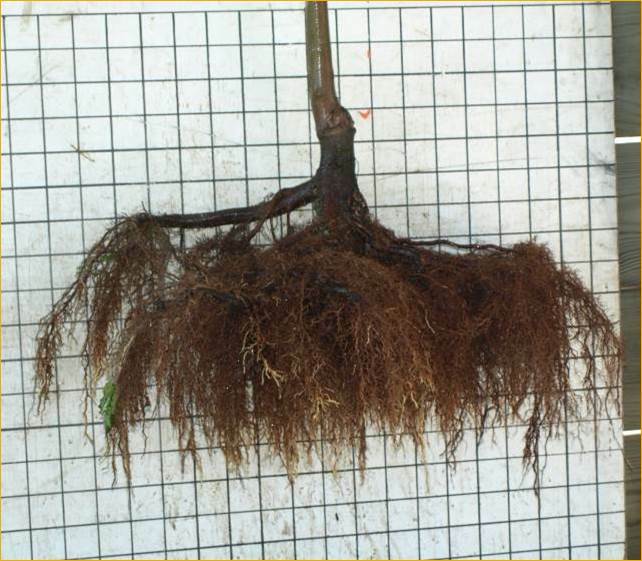 Roots of a bareroot tree after going into a gravel bed, showing the fibrous root system produced. A gravel bed is an irrigated pile of gravel where bareroot trees are heeled in and held from the spring until the fall. During this time the above ground portion of the tree grows normally while a fibrous root system forms in the gravel. Trees are easy to remove from the gravel bed and transport to planting sites. 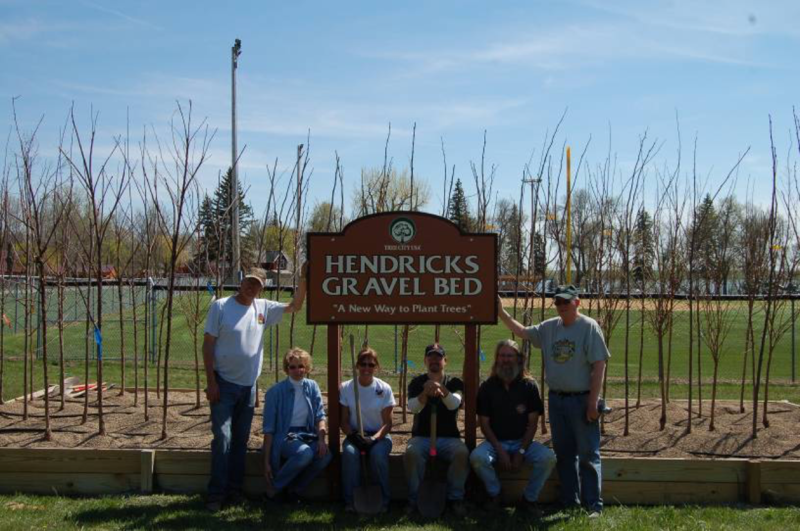 Over 60 Minnesota communities and counties are using gravel beds. Pictured here is the largest, operated by Hennepin County (Minneapolis and western suburbs) with a 1,500 tree capacity, and one of the smallest in the City of Hendricks, in rural Minnesota, population 694. Hendricks decided to showcase their gravel bed, by locating it in their busiest park. Increasing fibrous roots, which minimizes transplant shock. Planting in fall instead of the spring. Money saved by using barefoot trees that are typically half the price of containerized trees and a quarter the price of balled and burlap trees. Tree species availability increased because generally there are more species available as bareroot trees compared to containerized and balled and burlap trees. Injuries by staff and volunteers decreased because bareroot trees are lightweight and usually need shallow holes. The All You Need to Know About Community Gravel Beds by the University of Minnesota is a great resource to use to learn more about gravel beds and to get started on developing one. Download a copy today! tinyurl.com/ydxbnw9n . As a non-profit organization serving the 24 communities within the Normandy School District in St. Louis, Beyond Housing focuses on improving quality of life by taking a comprehensive approach to community development. They strive to make a real impact for their residents by supporting the entire fabric of what makes communities thrive: housing, education, health, job readiness, and economic development. Beyond Housing has received assistance from Missouri Department of Conservation (MDC) in the past, through our Tree Resource Improvement and Maintenance grants (TRIM), which provide cost-share funding for government agencies, public schools, and nonprofit groups to manage, improve, or conserve trees on public lands. The organization has used TRIM grants for tree maintenance and other community forestry projects. 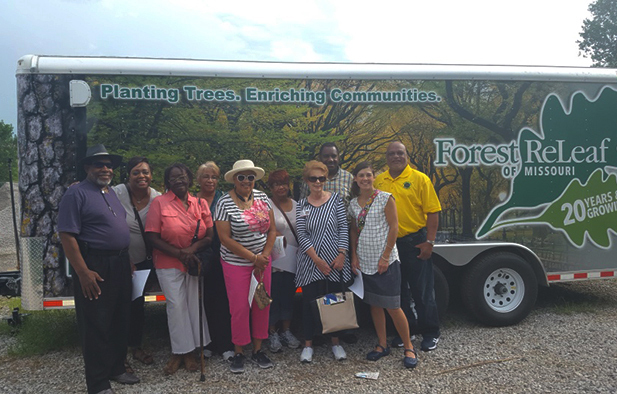 Community representatives from Vinita Terrace, Velda Village Hills, Uplands Park, Cool Valley, Wellston, Pasadena Hills, Pagedale, Bel-nor, and Pine Lawn tour the Forest ReLeaf Nursery as part of their introduction to community forestry and public tree management. This year, MDC partnered with Beyond Housing to develop a cooperative agreement that provides them with a full-time community forester. The goal of the partnership is to make sure that public tree care within the Beyond Housing’s area is fully incorporated into their comprehensive approach to community development. As we know, taking care of trees isn’t just about aesthetics. Trees in our communities provide environmental, social and economic benefits that improve the quality of life for everyone. With a forester on staff at Beyond Housing, they have a qualified expert to help make sure all 24 communities are making the best decisions about their public trees. The forester, Doug Seely, is tasked with developing potential TRIM grants, conducting tree inventories and management plans, preparing the communities for the impact of emerald ash borer, and developing an outreach program to help educate the communities on the importance of trees in their neighborhoods. He also coordinates with all 24 mayors and city councils on a frequent basis to move each community toward becoming part of the Tree City USA program. For many of the 24 municipalities, this marks the first time anyone has attempted to manage the trees in their communities. 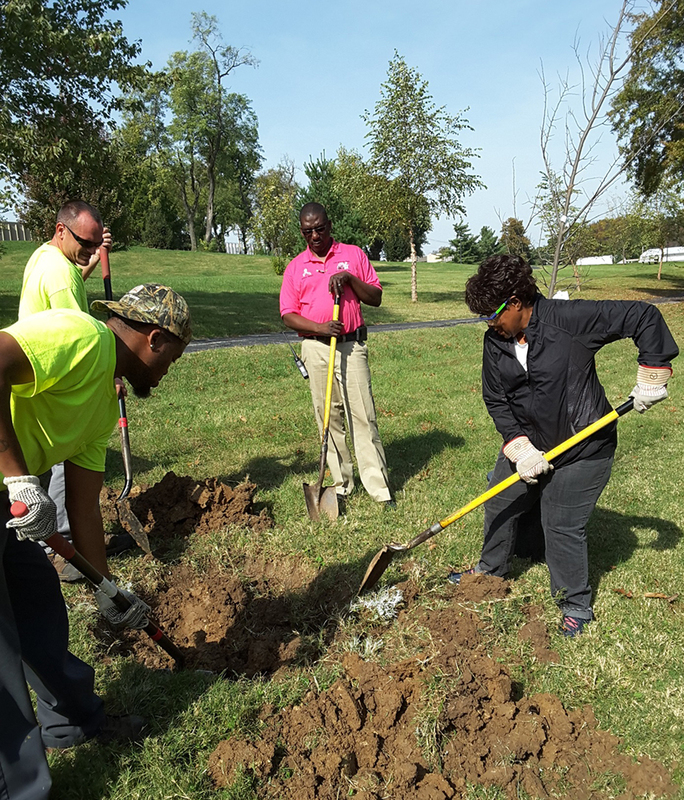 Vinita Park Public Works staff and community members dig holes for new trees in their community. Last fall, MDC Community Forester Danny Moncheski sat down with Beyond Housing’s forester, Doug Seely, to assist with administering the first batch of tree service contracts. The contracts are funded with a 50/50 match of MDC cooperative agreement funds and municipal funds from the communities within the Beyond Housing. 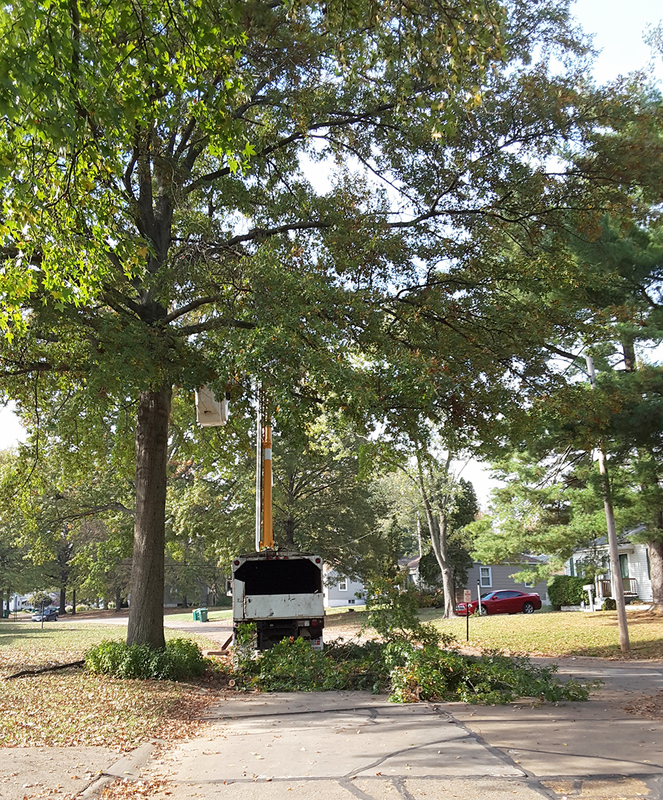 One of the first projects underway was hazard tree removal in the city of Pagedale, followed by projects in Hanley Hills, Velda Village Hills, and Pasadena Hills. Once the hazard trees are removed in the various communities, tree planting projects will follow. Danny and Doug are also working with Velda Village Hills to use structural soil as part of their sidewalk replacement program, with the goal of ending the long-time practice of using stump grinders to cut tree roots prior to replacing a sidewalk slab. Street tree trimming in Hanley Hills will make the neighborhood trees healthier. By receiving financial assistance to support the work, these small communities are working together to implement a wide-spread, self-sustaining tree management program. This great partnership between MDC and Beyond Housing will help further community forestry efforts in the St. Louis area and supports the overall benefits of trees in communities. In 2008, the exotic invasive Asian Longhorned Beetle (ALB) was first detected in the City of Worcester, Massachusetts. Following the detection, the United States Department of Agriculture (USDA) and the Commonwealth of Massachusetts established a cooperative program to eradicate ALB. To eradicate this pest, all infested trees are removed and chipped. Now, nine years later, well over 36,000 trees have been removed from public and private property, including from yards, parks, schools, and streets within the current 110 square mile regulated area that encompasses the entire City of Worcester, the second most populous city in all of New England after Boston, and four surrounding towns and portions of another one. In response to this large-scale tree removal, the Massachusetts Department of Conservation and Recreation (DCR) developed a well-coordinated reforestation plan, including a broad coalition of partners to work in cooperation so as to quickly restore the tree canopy for the regulated area. With federal funding provided through the United States Department of Agriculture Animal and Plant Health Inspection Service (APHIS), the United States Forest Service (USFS) and Commonwealth dollars, to date, the DCR Urban and Community Forestry Worcester Reforestation Program has planted 18,766 trees on both public and private property. This effort required significant outreach and education efforts on the part of DCR and partners. DCR hired full-time urban and community foresters specifically for the reforestation program and they worked with public and private landowners to gain approval to replant trees on public and private property. Each spring and fall, DCR hired a number of tree planters from within the community to plant the trees by hand. DCR Reforestation staff also educated citizens and the community in proper tree care and maintenance. When not overseeing the planting crews, the DCR urban and community foresters scheduled appointments to meet with property owners to discuss tree planting options, selecting the right tree for the right place from an offering of over 30 trees, including large shade trees, ornamentals, and conifers, ensuring a tree for every location. Until ALB is declared eradicated from the Worcester area, both tree removal and tree planting numbers will continue to climb, although these numbers now grow at a much slower pace than nine years ago. While removing trees to control the beetle is not an ideal option for most tree owners, they do have another option, and that is to have a new one planted on their property. In June 2011, the Asian Longhorned Beetle (ALB) was discovered in Clermont County, Ohio by an Ohio Department of Natural Resources (ODNR) service forester responding to a landowner inquiry. Since that discovery, the ODNR Division of Forestry has worked closely with the Ohio Department of Agriculture (ODA) and the U.S. Department of Agriculture (USDA) Animal and Plant Health Inspection Service (APHIS) to restore canopy lost from eradication efforts, survey high-risk sites throughout Ohio and educate the public about ALB identification and its potential impacts. In the fall of 2012, the ODNR Division of Forestry piloted an approach for restoring tree canopy lost in the eradication effort in southwest Ohio communities. The program’s intent was to restore lost canopy cover in maintained residential lawns, municipal streets and parks, commercial landscapes and other areas that would not normally support natural regeneration. Recovery in areas where regeneration occurs naturally, such as woodlots, stream banks, fencerows and non-maintained areas, was covered by the Natural Resources Conservation Service’s (NRCS) Environmental Quality Incentives Program (EQIP). The ODNR Division of Forestry also provided technical assistance for tree selection, installation, and maintenance to ensure that the trees were planted properly in locations that would not conflict with existing above- or below-ground utilities, or reduce vehicular or pedestrian mobility or visibility. 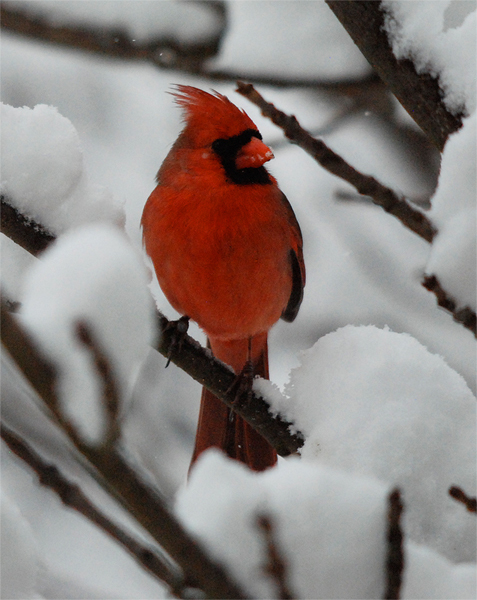 Property owners chose from a list of non-host species that were selected based on their aesthetic qualities and ability to perform well in the soils of Clermont County. 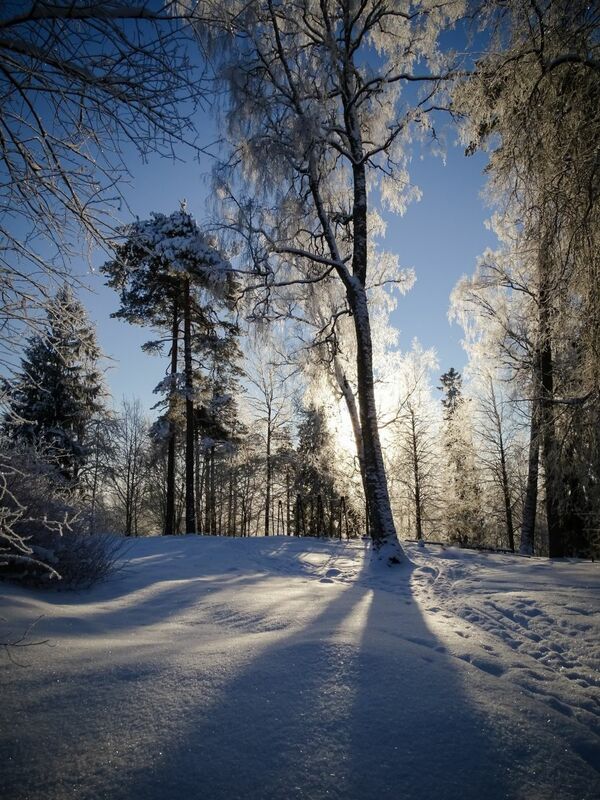 Each qualifying property owner was eligible for up to 10 replacement trees for their property. 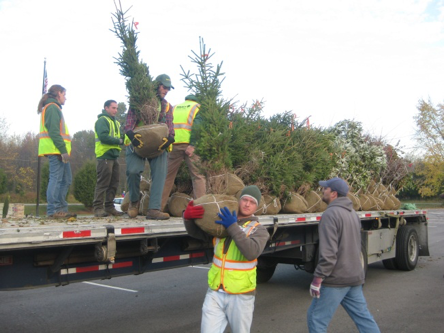 ODNR Division of Forestry staff, along with volunteers from Clermont County Parks, Clermont County Soil and Water Conservation District, ODA, USDA APHIS, Grant Career Center, Bethel Municipal staff and Davey Tree delivered and helped plant almost 300 trees on 55 properties in the pilot program. The large participation in the pilot program by affected property owners and volunteers spurred the establishment of the Tree Canopy Enhancement Program (TCEP), which provided an additional four rounds of tree distribution over the next several years. The last round of the TCEP in October 2016 distributed 372 trees to 83 properties bringing the program total to more than 1,600 trees distributed to more than 300 properties within the ALB quarantine zone. Through U.S. Forest Service grant funding and in coordination with ODA and APHIS, the ODNR Division of Forestry also conducts surveys for ALB in areas surrounding the quarantine zone in southwest Ohio and other high-risk sites throughout the state. Areas of emphasis include private woodlands, urban and community trees, parks, campgrounds, distribution facilities, firewood dealers and recreational areas where host tree species exist. Informational packets about the signs and risks of ALB are distributed to land and business owners and staff working at the high-risk sites visited in the surveys. Since many of the ALB infestations in the United States have been brought to officials’ attention by citizens, the importance of public outreach cannot be underestimated. The ODNR Division of Forestry conducts education and outreach at several meetings and forestry-related public events each year, as well as direct landowner visits to private woodlands in the areas impacted by ALB. Landowner visits focus on ALB identification and woodland management practices to address ALB impacts. Additionally, the division’s Urban Forestry Program hosted an ODA representative at each of the six regional urban forestry conferences to present Ohio’s ALB eradication program and further disseminate information. As the eradication efforts continue in southwest Ohio, the ODNR Division of Forestry will continue to work with its local, state and federal partners to restore lost canopy, survey high-risk sites, and educate the public about this potentially devastating invasive insect in our midst. The cabinets in your kitchen, your dining room table, floors in your office, and even the paper you write on are all products made from wood. Usually rural wood is used to make the products, but over the past several years a shift has been made, introducing the use of wood from urban areas to make these, and other, products. For example, urban wood has successfully been used in architecture, creating bowls, staircases, tables and now art. The urban wood used in these projects most would disregard, but the craftsman and artists behind urban wood utilization view urban wood destined for removal as an opportunity to create new life out of something others would reject. There are several factors that are considered when trees are marked for removal. Trees are considered hazardous because of where they are located, how tall they are, dead portions, or entirely dead trees. In Milwaukee, many trees were, and continue to be, removed because of a wide spread pest, EAB. Milwaukee is currently an EAB confirmed area in a quarantined county. According to the Wisconsin Emerald Ash Borer Information Source, the larva (the immature stage of EAB) spends its life inside ash trees, feeding on the inner bark where we cannot see it. This feeding disrupts the trees’ ability to move water and nutrients back and forth from the roots to the rest of the tree. The tree starves and eventually dies. Tim John, of the Fresh Perspective Art Collective, explained that the Collective is comprised of artists of the African Diaspora who stage and curate art shows. The Collective provides a platform for men and women to share their spirit of self-expression and build careers as professional artists. About 100 artists, from throughout Wisconsin, have participated in their shows, which have been staged in Madison, Milwaukee and Racine. While many of the artists have had extensive experiences with the Wisconsin Department of Corrections, others have not had any and are career professionals or own their own businesses. 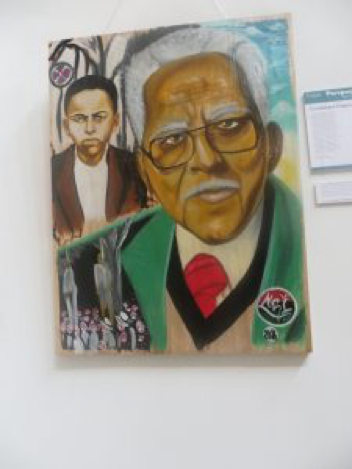 Dwayne stated, “The reason for the connection is that there is immense beauty in our urban communities. 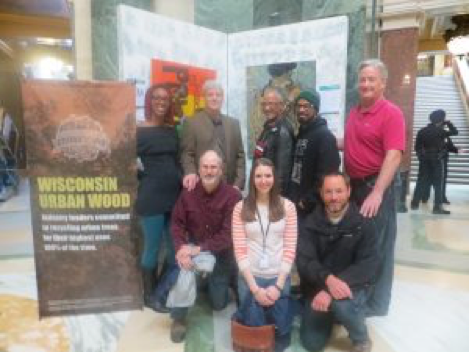 Urban wood is a product of these communities and therefore a natural medium that shares the story of the beauty, a beauty that is often overlooked.” He also commented that he, and the other members of Wisconsin Urban Wood that partnered with Fresh Perspective Art Collective, were proud of this connection. This exhibition, Urban Heroes, Urban Wood, brought communities together by combining urban wood and art. Wood that came from the community was utilized in a new way by its members to make art emphasizing individuals that built the community. This full circle exhibition is one of the many ways urban wood is being utilized and providing value. To learn more about this exhibition and the artists and people behind it watch this video. 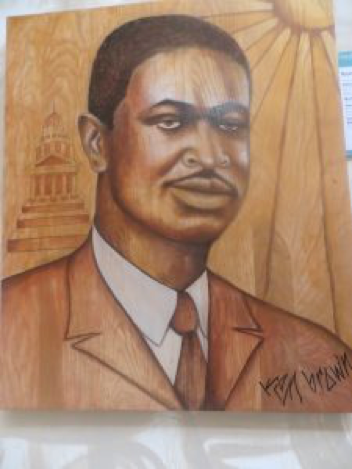 This article was written in partnership with members of the Fresh Perspective Art Collective and Ellen Clark, Communication Specialist for the Urban Forestry Program. Pennsylvania state law requires municipalities to compost or otherwise recycle woody waste rather than to landfill or incinerate it. In isolated incidences, arrangements are made to have logs sawn to lumber, but most often woody debris is ground into mulch. Cities are required to establish a wood waste recycling facility or to contract with a neighboring community that has one. Still, sometimes a community may resort to stockpiling large woody material on an illegal city site, or to burning residential yard waste collected along with other refuse, also illegal. In 2016 the City of Harrisburg initiated the process of securing a site on which to establish a wood waste recycling facility. In the summer of 2016, the USFS Forest Products Lab offered instruction on milling urban wood to Philadelphia parks and recreation staff. The Bureau of Forestry engaged Forest Products Lab staff in September to offer a similar workshop in the Harrisburg area, as a way to begin the conversation to link suppliers of urban logs to those interested in better utilizing them. Invitations went out to arborists, foresters, tree services, sawmill owners, craftsmen, cabinetmakers, and educators. A total of 60 people attended, with representation from all groups. The workshop provided an overview of urban wood use in other parts of the country; and presentations on assessing the quality of a log to determine its highest use, constructing a simple dry kiln, and producing biochar from scrap wood. Field demonstrations on milling and air drying wood, and on the small scale production of charcoal were included. A number of beneficial connections resulted from the workshop: the City began furnishing logs to a small specialty sawmill, and a regional vo-tech school began manufacturing charcoal with waste wood from its carpentry program. The school contacted the Bureau of Forestry to discuss the possibility of initiating an urban wood processing curriculum at the school including sawmilling, kiln drying the wood, producing charcoal on a larger scale, and possibly using the charcoal in the horticulture program. We worked with them to apply for a Landscape Scale Restoration Grant in November to help fund the initiative, and received word in July that the project had been approved for funding. With the combination of school and grant funds, a portable sawmill will be purchased, a dry kiln will be constructed, and a charcoal retort will be manufactured. A curriculum will be developed to instruct the students in milling and drying the wood, and possibly selling the material to further the program. Construction and welding students will be involved in building the dry kiln and charcoal retort, and the production of charcoal will be introduced as a means of better utilizing waste wood. The horticulture program will utilize charcoal to enrich and loosen the soil, and will experiment with raising and providing bare root trees in the mix for use in community tree planting efforts. The City of Harrisburg, meanwhile, finally acquired use of the site that had been selected to establish its wood waste recycling facility; designing the facility is currently underway. The Bureau of Forestry is working with them to try to ensure that sufficient space will be allocated for milling and air drying lumber, and eventually to also manufacture charcoal for biochar. In Philadelphia, the City Parks Department has begun contracting with a portable sawmill owner to mill city logs to lumber. The lumber has been used internally for raised garden beds and small bridges, as well as for shelving and cubbies in city buildings. In recent months, the City has also provided lumber to an operation that works with homeless people to build and repair homes. A recent contact has also been made to provide material to an organization that teaches basic carpentry skills to prisoners soon to be released. At the same time, the Bureau of Forestry has introduced the City Parks Department to the process of manufacturing charcoal, and the possible uses for growing out bare root trees and for enhancing soil in street tree plantings. A commercial recycling firm has expressed interest in the large scale manufacture of charcoal if markets are developed. Currently the Bureau of Forestry is exploring options for creating an online database to link urban log suppliers with potential users. Municipal and commercial tree crews, as well as property owners removing shade trees, will be able to locate portable sawmills interested in purchasing logs or willing to process logs for a fee; or in finding firewood vendors or biochar manufacturers who may be interested. Woodworkers will be able to locate a source of rough lumber from urban trees, possibly with the address of the source as an added point of interest. Job training facilities like vo-tech schools, prison re-entry programs, and summer youth programs will also find sources of local wood through the network. Recycled materials outlets, such as Habitat for Humanity Restores, interested in selling urban wood will also be linked in to provide for homeowners, hobbyists, or other occasional users wishing to purchase small quantities. Much work remains to be done, but beginning at the local level with regional networks, and building out from there, seems to be the best approach for Pennsylvania. The Huxley tree board gathers in the parking lot at Centennial Park early on a Saturday morning. The tree board is volunteering their time in the summer months to conduct a community tree inventory of the 646 city owned trees. Their many hours conducting the inventory will result in a tree management plan to improve the health of the city owned trees. It is estimated that the trees will provide $57,704 worth of benefits annually, but benefits continue beyond the inventory results. The engagement of the tree board in management of city owned trees will benefit the small community for years to come. 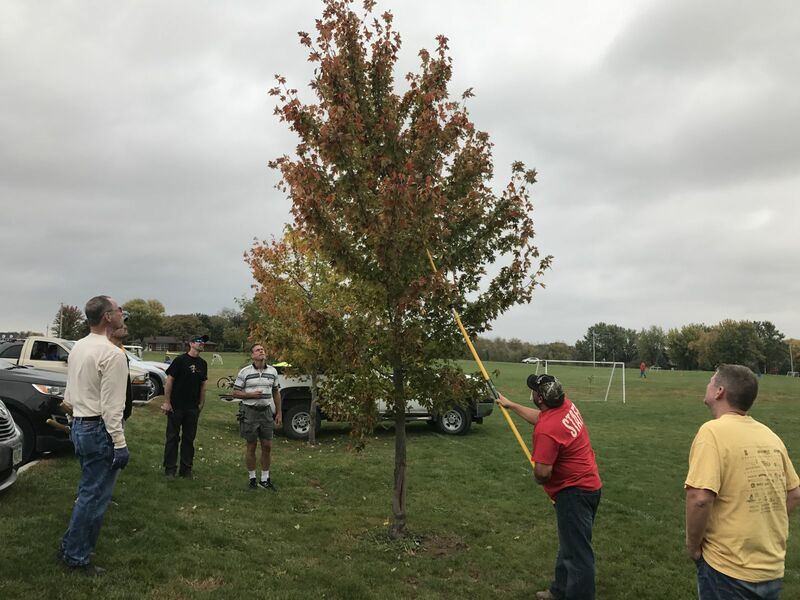 The community tree inventory is just one of the City of Huxley’s successes through the Sustainable Urban Forestry Assistance and Training (SUFTA) program. The program is funded in partnership with the Forest Service and the Iowa DNR. The program assists communities by training and educating city staff, tree board members, elected officials, and community members in order to enable each community to develop and maintain a sustainable forestry program. In total, twenty communities will receive intensive training by a team of DNR Forestry staff in tree id, tree inventory, tree planting and maintenance, and many other topics. Each community will receive a community tree management plan with canopy goals, scheduled maintenance, and planting schedule. The focus is to prepare and manage Emerald Ash Borer, train municipal staff in urban forestry best management practices, as well as increase urban tree canopy. During the 2015 grant application cycle Huxley was one of ten communities awarded the grant, the others were: Algona, DeWitt, Hiawatha, Maquoketa, Newton, Sioux City, Spencer, Waverly, and Webster City. The 2014 grant cycle assisted ten communities the previous year.